Six-Month Anniversary Event Is Now Live! The Six-Month Anniversary Event revealed in Dragalia Digest is now live! 1. The Dream Summon Special is now available for purchase. 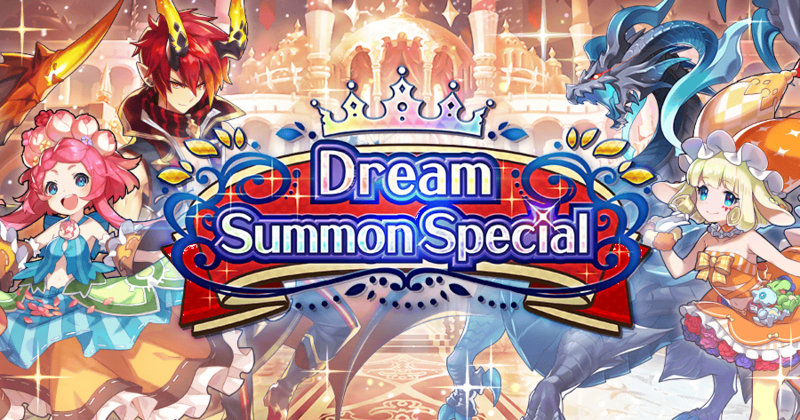 The Dream Summon Special became available in the Shop 11:00 PM Mar 26, 2019(PT)/6:00 AM Mar 27, 2019(UTC). The Dream Summon Special is a special pack that lets you purchase one Tenfold Summon Voucher and one adventurer or dragon of your choosing. ・The Dream Summon Special may only be purchased once during the availability period. ・You can't select an adventurer you have already obtained. ・To see which adventurers or dragons you can acquire, tap the Dream Summon Special banner on the home page, then see Lineup on the pop-up which displays after you tap Purchase for the Dream Summon Special under Value Packs in the shop. Get Tenfold Summon Vouchers and wyrmite when you login during the event duration. Log in during the 10-day bonus event to earn up to three Tenfold Summon Vouchers and 2,000 wyrmite! ・The log-in bonus will be sent to you every day after 15:00 when you log in. ・Gifts sent as log-in bonuses can only be accepted for a limited time. Six-month anniversary promotions are live as of 11:00 PM Mar 26, 2019(PT)/6:00 AM Mar 27, 2019(UTC)! Use these promotions to upgrade your teams! While the promotion is active, drop rewards you can obtain from Avenue to Power and Dragon Trials will be doubled! While the promotion is active, the amount of rupies earned from Avenue to Fortune and drop rewards obtained from Elemental Ruins will be doubled! While the promotion is active, drop rewards you can obtain from The Imperial Onslaught will be doubled! Additionally, stamina recovery speed will be doubled! 4. Gala Dragalia is live! Gala Dragalia started 11:00 PM Mar 26, 2019(PT)/6:00 AM Mar 27, 2019(UTC)! Gala Ranzal appears in this limited-time summon showcase. For more information about Gala Dragalia, see the Gala Dragalia Is Now Live! notification.